As diverse are the ranges of tasks in our company, the persons who work for HJS are equally as diverse. We are especially proud of this. With us, people from eleven nations work in more than 80 professions. We appoint approx. six to eight trainees annually in up to ten different professions. We are distinguished as a family-friendly company. 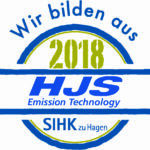 As a family managed, middle-sized company with headquarters in Menden/Sauerland, we at HJS Emission Technology GmbH & Co. KG have long-standing experience and competence in the area of exhaust gas treatment. With approximately 450 employees, we develop, produce and market systems for the reduction of emissions of pollutants and corresponding components. Our company HJS was founded in 1976 from an innovative idea and, even after more than 40 years, enthusiasm for technology is still a significant mainspring for our employees who are continuously developing new ideas, processes and products. Caring for persons and the environment in this case arises from conviction in our own company. As well as the HJS products, the careful and responsible handling of human and natural resources also plays a central role in our everyday life. Our management system is correspondingly certified. Integrity and sustainability are the main supports of our commercial action. Open and honest dealings with each other, as well as with business partners and customers, form the basis for our action within the company, right from the very first day. We therefore inform and train our employees regularly in the subject of business ethics, as well as in the areas of health provision, occupational safety and environmental protection. The thought that we can make the world a little cleaner with our products motivates us. We ensure at all times that our products also do what our customers expect. As a result, we take over responsibility for product and company. In 2003 HJS received the German Environmental Prize for the development of the diesel particle filter on sintered metal base – the Sintered Metal Filter (SMF®). The Federal President ret. On 26th October 2003 in Osnabrueck, Johannes Rau presented Professor Dr. Claus Mattheck, a German scientist for damage appraisal, and Dipl. Ing. 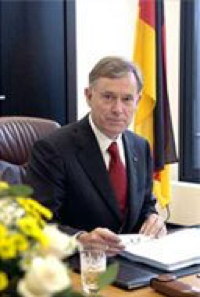 Hermann J. Schulte, owner and managerial company shareholder of HJS Emission Technology, with the German environmental prize 2003 of the German Federal Environmental Foundation [DBU]. Federal President ret. 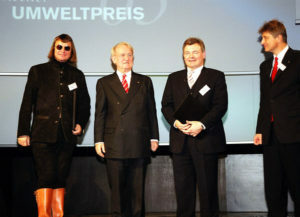 Johannes Rau, presents the German Environmental Prize 2003. As well as the total-corporate performance of Hermann J. Schulte, the DBU appreciated in particular the development of the HJS particle filter for diesel engines. HJS has developed with its employees an innovative diesel particle filter system, which eliminates the discharge of solid pollutant component parts almost completely. Decisive advantages result from the special material properties of the sintered metal and the system structure of the filter. In order to reduce the emission pollution of the environment, every diesel engine should be equipped with a diesel particle filter as quickly as possible. The HJS filter concept offers the best prerequisites for employment with cars and commercial vehicle diesel engines, but also in city buses, municipal vehicles, construction and agricultural machines (among others). The SMF® can be used both in the original equipment and in retrofitting, and enables soot-free exhaust gas. The German Environmental Prize 2003 confirmed HJS in its consistent further development of future-oriented diesel exhaust gas technologies. The initiative “Germany – Country of ideas” has distinguished HJS with the development of the efficient diesel particle filter (DPF®) on sintered metal base as a “Selected Site 2006”. We are very pleased with this acknowledgement! With this, HJS numbers among one of the 365 most interesting sites in Germany. Within the framework of the World Cup 2006, the project “Germany – Country of ideas” was formed. The initiative is supported by the Federal Government and the economy, represented by the Federal Association of German Industry (BDI) and leading companies. “Germany – Country of ideas” stresses the strengths of location Germany and reflects significant characteristics of the Germans: Imaginativeness, creative passion and visionary thinking. HJS Emission Technology wurde 2012 mit dem „MAN Truck & Bus Supplier Award“ ausgezeichnet. 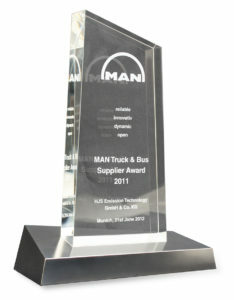 HJS Emission Technology wurde 2012 mit dem „MAN Truck & Bus Supplier Award“ ausgezeichnet. Dieser Award wird an Firmen verliehen, die mit ihren Produkten in besonderem Maße zur Qualität und Zuverlässigkeit der Busse und Lastwagen beitragen. MAN Truck & Bus zeichnete dieses Jahr zehn Zulieferer für ihre hervorragenden Leistungen aus. Seit 2006 wird für die Euro V- und EEV*-Busse der HJS Sintermetallfilter (SMF®) bei MAN Truck & Bus erfolgreich eingesetzt – innovative und systemspezifische Abgasreinigungstechnologie. Die technologischen Vorteile des SMF®sorgen somit nachweislich für eine ökologische & nachhaltige Mobilität der MAN-Fahrzeuge auf deutschen und ausländischen Straßen. Es ist geplant, den HJS Sintermetallfilter zukünftig auch für Euro VI MAN-Stadtbusse einzusetzen.